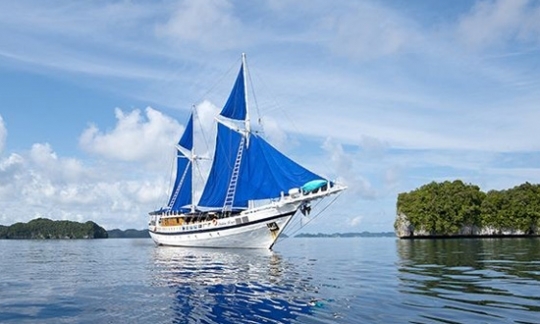 The SY Philippine Siren is a 40m long luxury liveaboard constructed in 2013 in the traditional gaff-rigged phinisi-style, out of Indonesian ironwood and teak to Lloyds safety standards. 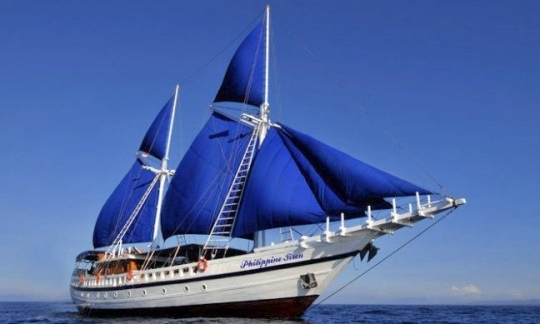 She accommodates 16 guests on a variety of cruises offering the best of Philippines diving in Tubbataha, Visayas, Malapascua and Donsol. 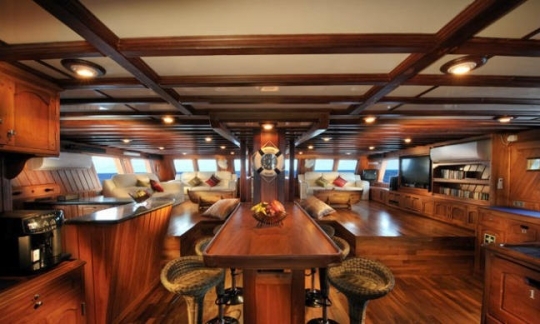 Being part of the prestigious Siren liveaboard fleet this schooner is European-owned and managed and has a crew of 12. Guests are accommodated in 8 well appointed, air-conditioned, standard en-suite cabins where you can retire and enjoy flat screen televisions with pre-loaded movies and a music system should you desire quiet relaxation time. After an action-packed day's diving, tired muscles can be soothed in the privacy of your cabin by the resident masseuse. Packing for these trips will be light as bathrobes, towels, shower gel and hairdryers are supplied. For your safety, cabins are fitted with smoke detectors and fire extinguishers. The Philippine Siren's design has been fine-tuned to the needs of scuba divers. 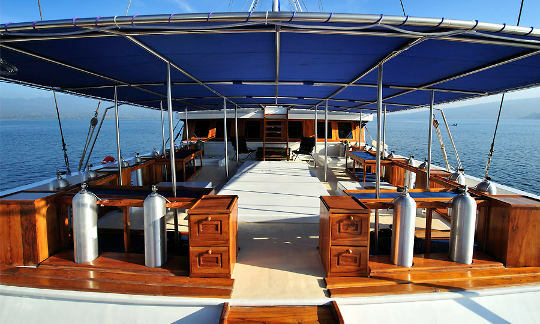 The large dive deck includes individual storage draws, a dedicated table for charging and preparation of camera and videography equipment, large separate camera rinse tanks and well-trained deck crew who will take care of you and your equipment. Dive equipment is provided (except for torches and dive computers). 12L tanks are supplied together with DIN adaptors if needed, as well as lost diver devices. An added advantage of diving trips on the Philippine Siren is that they offer free nitrox. Hot water showers on the deck are a welcome convenience after each dive. 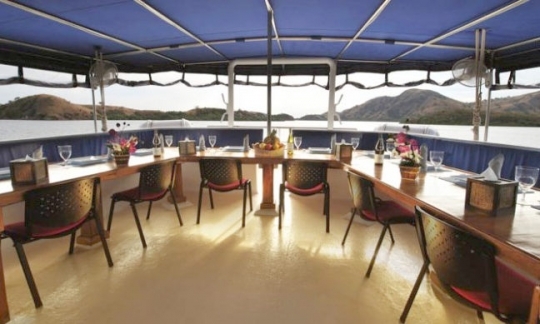 Beautiful tropical scenery is the backdrop for all meals which are served on the covered, open air main deck. A variety of Asian and western buffet meals are included, and if guests have special dietary needs, they can be accommodated if advanced notice is given. A toast to each day's incredible diving in the Philippines is enjoyed with complimentary beer, or if wine, spirits or cocktails are preferred, they are available at a reasonable cost. 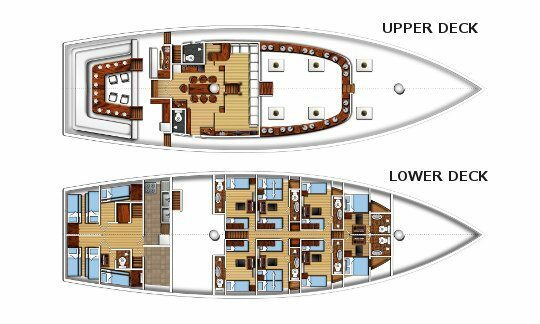 The liveaboard's spacious air-conditioned saloon is the ideal meeting place to view fellow divers' images and videos as well as to make new friends over a board game or discussion about the day's marine sightings. 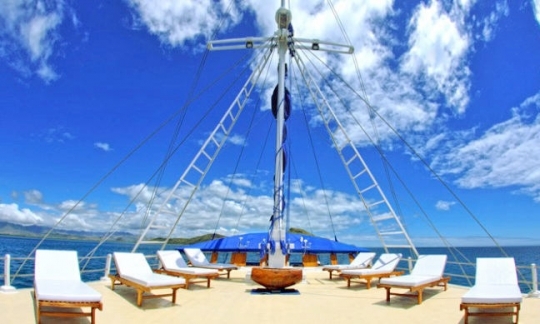 Sun lovers can relax on the reclining loungers on the spacious sun deck. Kayaks are available for those who still have the energy to explore. Cruise price per person includes: Cabin accommodation with air-conditioning, breakfast, lunch, dinner, snacks, drinking water, hot drinks, soft drinks, fruit juices, electrolyte powder, beer, transfers to and from the boat/airport (for trips starting/ending in Cebu and only from the airport, local hotels in Mactan Island, Cebu City and Mandaue City), dives, experienced English speaking divemasters (6 divers per guide), use of essential scuba equipment (BCD, regulator, shorty wetsuit, mask & fins, weights & weight belt, SMB), nitrox for enriched air certified divers. Cruise price per person excludes (mandatory, unless customer provides own): Dive computer US$ 6 per day, marine park fees: Apo Island & The Visayas (6 nights - US$ 75, 7 nights - US$ 100, 10 nights - US$ 155), Malapascua Island & The Visayas 10 nights - US$ 155, Tubbataha 6 nights - US$ 120, Tubbataha, Apo Island & The Visayas 13 nights - US$ 160, diving insurance. Unless otherwise stated, all the listed items need to be paid on arrival. Optional extras: Torch US$ 6 per day, transfers to/from Cebu to/from Moalboal (where necessary), alcoholic drinks, travel insurance (highly recommended). Unless otherwise stated, all the listed items need to be paid on arrival. 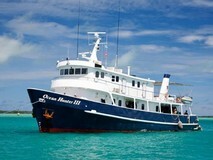 Tubbataha Reefs Natural Park: Departs from Puerto Princessa. You are required to book a return flight to/from Puerto Princessa on Palawan Island. Domestic connections are possible from both Cebu and Manila. Malapascua Island & The Visayas: These trips depart from Cebu. Apo Island & The Visayas: These trips depart alternately from Cebu or Moalboal. We recommend booking your international flight into and out of Mactan International Airport, Cebu. For Cebu departures, your flight should arrive no later than 12 noon on the first day of the cruise. International flights on departure day should be booked for no earlier than 14:00 hrs. Transfers to and from the boat in Cebu from local hotels (Mactan Island, Cebu City and Mandaue City) are provided free of charge. Transfers to Moalboal are provided at additional cost. For all of these routes in the Philippines, we recommend spending at least 1 night on land either side of your cruise, to ensure you are well-rested and on time for your domestic flight or minibus transfer. For all itineraries the operator will handle your airport to boat transfers. The last dive of the trip will be at around 13.00 hrs. Please wait at least 18 hours before flying after diving. Diving Environment: The Philippines is made up of over 7,000 islands within the coral triangle. Steep walls, offshore pinnacles, from coastal reefs with excellent macro life such as pygmy seahorses and frogfish, to areas with an abundance of whale sharks plus rare encounters with thresher sharks. 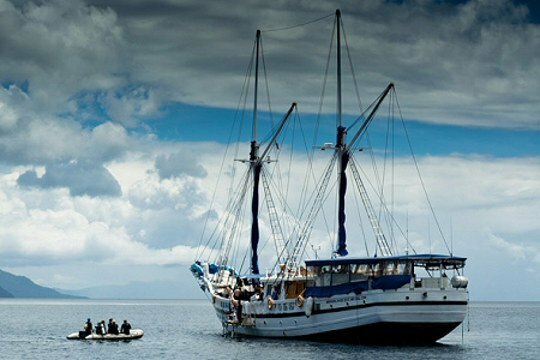 Roughly speaking 'rainy season' is June to November, and dry season is December to May, although the liveaboard safaris operate year round and follow the most reliable weather patterns. Water temperatures range usually between 24 and 28°C / 75-82°F so wear an appropriate exposure suit. Most people are comfortable in a 3mm full length wetsuit. Non-diver rate: No discount available. The non-diver package includes 1 free massage a day, a complimentary bottle of wine, kayaking and snorkeling. 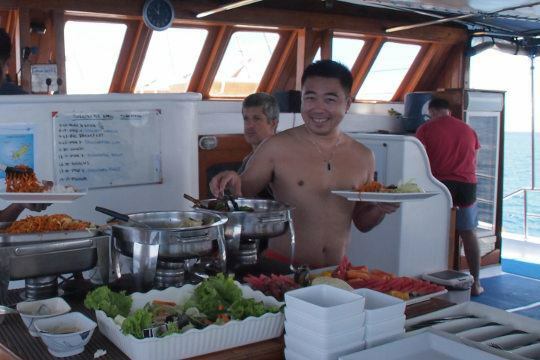 Single supplement (if you do not want to share accommodation): This is optional - single travelers may choose to share a cabin or if they would prefer to have a cabin to themselves, they need to add 100% to the published price and they will enjoy the Premier package (this includes 1 complimentary massage and 1 bottle of wine. Marine park fees and any fuel surcharges will not be charged to the client). Dive clubs and group discounts: Pay for 7 guests and 1 extra person can join the cruise in a Standard cabin free of charge (total 8 guests). 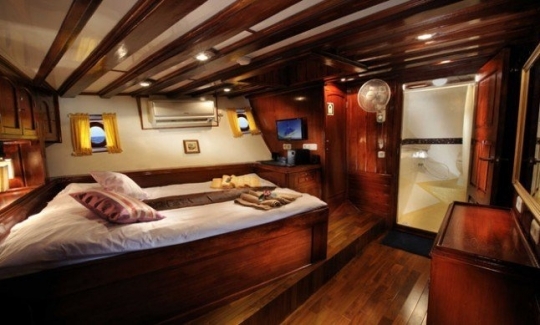 The SY Philippine Siren has 8 air-conditioned, double bed and twin bed cabins with en-suite private bathrooms, all situated on the lower deck and forward of the engine room. 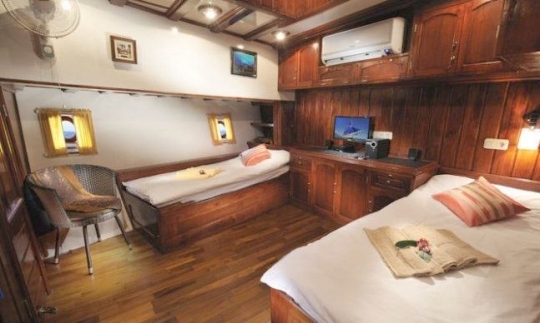 2 cabins have double beds, 4 cabins have twin beds, and 2 cabins have twin beds which can convert to double beds. After boarding and settling in, a light snack is enjoyed before the evening meal. As each new day dawns pre-breakfast is served, providing energy for the first dive. A cooked breakfast, lunch and dinner are served throughout the day, together with snacks and refreshments. You can take in the island scenery views while a variety of Asian and Western meals are served, including seafood, chicken, pork, beef, vegetables and salads. You may be tempted by delicious desserts such as molten chocolate cake, cheesecake or mango float. Pre-breakfast, breakfast, lunch and dinner included, with snacks in between. Toast, biscuits, fresh fruit, drinking water, fruit juice, soft drinks, beer, electrolyte powders, and tea & coffee are available free of charge. Wine, spirits and cocktails are available for purchase. First meal served is snacks and dinner on the first day of the cruise, depending on your time of arrival. Breakfast and or lunch served is on the last day of the trip, depending on your time of departure.